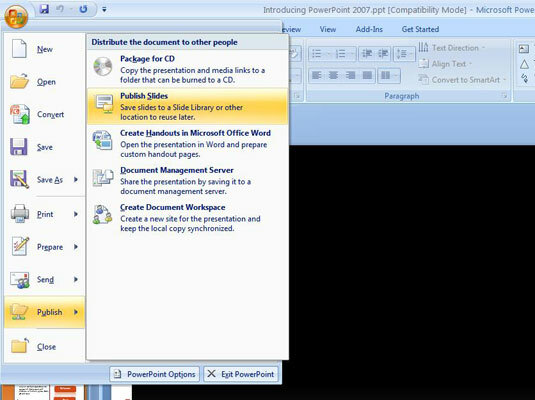 When you saved PowerPoint slides in a slide library, you can easily insert them into any PowerPoint presentation you create. You can even have PowerPoint check to see whether the slides have changed and automatically update them with the changes. To save one or more slides to a slide library, you must first create the slide library. 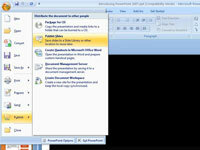 That’s a task better left to a SharePoint system administrator. If the slide library has already been created for you, and you’ve been provided with the URL (that is, the Web address) of the slide library and any login credentials you might need to access it. Preferably, one that contains the slides you want to add to the library. 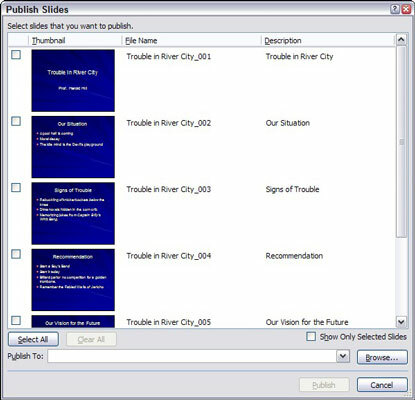 2Choose PublishPublish Slides from the Office menu. A new screen pops into action. 3Select the slides you want to add to the library. To select an individual slide, select the check box next to the slide thumbnail. 4Enter the URL of the slide library in the Publish To box. The slides are copied to the slide library. Depending on the speed of your Internet connection and how many slides you selected, PowerPoint might take a while to publish the slides.